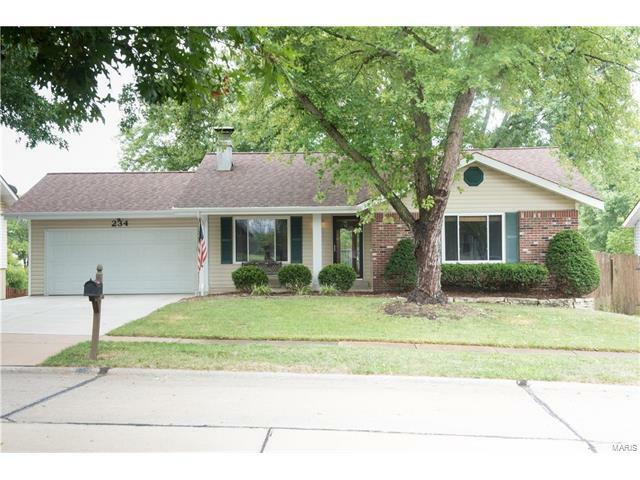 This ranch style home has 3 beds 2 baths and is located in Parkway School District. Upon entering there is a living room with hardwood floors and wood burning fireplace. Make your way to the kitchen with a window looking out to the backyard, ample cabinet and counter space, and separate food pantry. The kitchen opens to the dining room and has a sliding glass door walking out to the newly stained deck overlooking the private backyard and peaceful pond. The master bedroom has a full bath with a door to the hallway where you will find two additional bedrooms. The lower level is finished with a large rec room, additional sleeping area, and another room perfect for an office space or playroom. Walk out to the patio and large fenced-in backyard. There is a newer concrete driveway to complement the 2 car attached garage.This home is located in the highly sought-after Ballwin area & is awaiting your Finishing Touches. Close to restaurants, shopping, Castlewood State Park, and highways. West on Big Bend from Hwy. 141, Right on Shadowoak Dr., Left on Timberfield Dr. then Left on Vistaoak Ct, home is on the left.